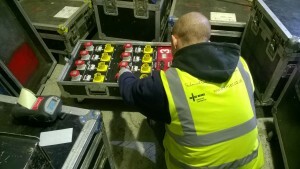 Our team offers the industry a complete inspection and testing program aimed to encompass all aspects of theatre electrical and inspection work to NICEIC standards. Inspection and testing of industry cabling, such as Socapex, IWBs and distros. Our knowledge of specialist systems allows us to carry out these works, not only producing credible recommendations, but also with safety of your equipment in mind.